It's pretty obvious that this card exists mainly as a counter-measure against Flashback and any other graveyard shenanigans. In a set with the Golgari (and the Orzhov are coming up next set) that's worth having an answer to. Thankfully, the Zealot's ability as a combat creature is pretty solid as well, so if you sideboard in the Zealot you won't have to worry about it being useless. On the other hand, that RR cost might be difficult to scrounge up in a multicolor block. Will there be a viable mono- or mostly red deck? Will you be able to get this on the table before the opponent finds his Snapcaster? Only time will tell! I think some people are calling this the best aggressive red two-drop ever, and I do understand why. Really, I do. My only reservation is that not every environment has a lot of spells being cast from graveyards in one way or another, and so the Zealot will occasionally be seen as having sort of a false situationality - you look at her and see Snapcaster Mage hosing, and sort of gloss over the fact that a 2/2 with first strike and haste for two mana is really good. Like insanely good. Welcome back readers todays card of the day is an interesting counter to Snapcaster Mage and decks that rely on flashback. A 2/2 First Strike and haste creature for two is quite powerful and then the added ability is just icing on top in standard this card should see some play in aggressive decks and is a powerful way to prey on flashback providing a disincentive to use this spells if they don’t deal with the Zealot first it also is a human which adds some relevance. In modern I could see this seeing some play as well being aggressively costed and then hosing flashback strategy is decent and could see some play. In legacy and vintage this card doesn’t effect many deck types and is just a decent beater making it an unexciting choice I don’t foresee this card seeing much play in these formats. In casual and multiplayer its strictly a counter to predominate flashback decks making it really narrow outside its small beater body but if that is what your looking for then this card fills the bill but I feel its more of a niche card. In limited its solid early drop but unexciting and has a double red cost, the fact there isn’t flashback in limited truel limits this cards usefulness outside of constructed formats. This card is a safety hose for flashback decks on an aggressive body meaning it should see decent constructed play and a little bit elsewhere due to its aggressive nature. Today's card of the day is Ash Zealot which is a two mana Red 2/2 with Haste, First Strike, and deals three damage to a player for each card they cast from the graveyard. Even without the effect this is a very solid card that would likely see play in mono-Red builds, but add in the burn and it becomes a maindeck threat that acts like a sidedeck response to multiple designs. The only drawback is the double Red in the casting cost, which really forces this into a narrow number of decks and not being a goblin likely keeps it from being used in the popular theme. Overall this will definitely see play at the tournament level, though the deck it will best fit in may not arrive until the next expansion. For Limited the double Red is a drawback, but the burn effect may make this a viable late game play as the block expands. Until then it having Haste allows this to be an excellent topdeck and the First Strike is always nice to have. The mana requirement and currently non-useful effect in the format drop this down from being a first pick and removal or a larger threat should probably be drafted before it in Booster. In Sealed when running a Red guild this isn't a bad addition as even with the double Red the Haste and First Strike should allow uses both offensively and defensively. Welcome to another great card of the day review here at Pojo.com! We are continuing our look at Return to Ravnica today by glancing at Ash Zealot. 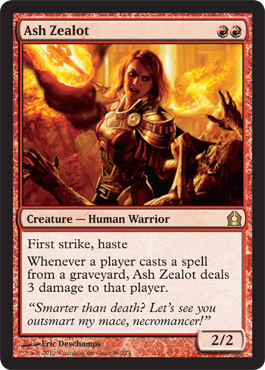 Ash Zealot is a rare red creature human warrior that costs two red mana for a 2/2. Ash Zealot has first strike and haste and says whenever a player casts a spell from the graveyard, Ash Zealot deals three damage to that player. It is no secret that I am a huge fan of red. Cards like Ash Zealot are clearly the reason. While Ash Zealot may seem like a sideboard option, it shouldn’t be. At just two mana for a 2/2 first strike and haste, I say you run it main deck. Should the secondary ability actually help you, that’s just a bonus. Kind of like you should have main decked the Elite Inquisitor from Innistrad. Sometimes you have to look at the broad spectrum, and hope that the potential bonuses end up being exactly that, extra bonuses. With how much Flashback there was, and cards like Gravecrawler, that can become a thorn in your side, this kind of potential is amazing. But forget about all of that for a second and look at what it is, a hasty 2/2 first strike for only two mana. What is not to like?